“I was 12 years old and I was watching a TV commercial and I saw Christy Turlington in a Maybelline ad. She was walking down a New York City street, turning around and looking all cute at the camera and I remember thinking, “I want to be that girl,” the Maybelline girl. I crossed my fingers and prayed every night until I got the Maybelline contract when I was 18. I was so into it! Maybelline’s Great Lash Mascara was the only makeup I owned up until I was 20. That really shaped my whole makeup career and life. My modeling career started when I was 12 years old at a family BBQ. This lady at the BBQ asked me to do a Benetton fashion show in San Francisco and there was a modeling scout there who asked me to come in. From 12 to 17 years old, I modeled in San Francisco. It definitely wasn’t high fashion but I was doing some gigs. I was modeling for Esprit, Macy’s, and Levis and the makeup was very natural looking but I was always interested at how the makeup would transform me from shoot to shoot. I was a different person at each of these shoots and I found it really fascinating being able to change into a different character through makeup. I’ve always seen makeup as an art form, so I would ask the makeup artists if they studied painting. They were always using their fingers to blend instead of using a proper brush. Everyone had their own technique and it felt very creative and artistic. My question to these makeup artists was always the same, “What is your interest in painting and art?” and they would all have their own stories and it was just so interesting. I never saw makeup as something as simple as stuff that’s put on my face because I’m a model. For me, it was and is a very beautiful, artistic experience. Becoming the Maybelline girl threw me into a much deeper business of makeup. I learned about marketing a brand, behind-the-scenes of product launches, and how they decide on colors – the whole breadth of the business of makeup which was all very interesting to me because I’m an entrepreneur by heart. I also got to work with the best makeup artists in the world. They were doing serious makeup looks on me and we had tons of shoots every year. I became really interested in the makeup artistry of it – the techniques and colors. On the flip side, I was also really excited about the business aspect. I came from San Francisco from a very healthy, socially conscious family, so when I realized I really enjoyed this business and I enjoyed the power of makeup on me, I began to look into what was in makeup – natural makeup, toxic makeup, what was good for me, etc. Every single person told me it would be impossible to create high performing natural makeup. I didn’t think that was true and I wanted to prove them wrong, for my own rebel sake. I also still wanted to wear makeup but didn’t want the negative effects of it. My grandmother had breast cancer, so I am really sensitive to chemicals. My mom has chronic fatigue syndrome and she’s had it for 20 years. Any chemical in our life was a no-no. I wanted to see if I could make great makeup that was also good for you and that was the beginning! I didn’t do my own makeup for a long time because I was spoiled and had makeup put on me everyday, all day, by the best people. Once I became very interested in makeup, I started to pay attention and I found there’s this whole vault of secrets and tricks. I learned from the best. Most of the makeup artists I worked with used their hands and their fingers. I felt like I was their canvas and they were finger painting. I would buy the same products they were using on me and I would go home and play with these looks. Eventually, I would make all my favorite products, but naturally. Now I do my own makeup and that really came with time, as my confidence grew. I do makeup for my friends and I teach people how to put on makeup, because makeup seems really scary at first but it’s really not. It’s a total confidence booster for women to know how to put on their own makeup and to also know that it looks good and feels good. I use my fingers mostly and I constantly blend. It’s kind of like chalk pastels, which I love doing as well, so I suppose that’s my connection to makeup. A lot of powders and creams are like that, so I just put them on and blend and blend and add. It’s really fun. My signature look and the one thing I love is eyeliner in the inner rim of my eye. I also love golds, coppers, and browns – a smokey eye, blended out. And a natural pinky lip. Shu Uemura Eyelash Curler: I’m obsessed, I can’t live without it, and I have a serious addiction when the curler pulls at my lashes. It’s like when a smoker needs nicotine in their lungs, I need to tug on my lashes. Priti Nail Polish: It’s a natural nail polish brand. I like naked nails, like a pinky light pink and I also love a sparkling navy blue. I’m obsessed with that on my toes. It’s like a starry night on my toes. The first time I did it, I felt so connected to everything and powerful, but now I just love how intense it looks. Mason Pearson Brush: My dad is partly from London and I just grew up with this brand. It feels so good and I feel like it’s taking care of my hair. Plantlife Lavender 100% Pure Essential Oil: It’s a little dropper that you can get at Whole Foods. I put a tiny bit on my palms and on my neck, and sometimes on my pillow at night. Before any big show or presentation, I put it on. Lavender is super calming, simple, not too expensive, and just a really easy way to calm your senses. I never used any kind of fragrance when I was young, but I grew up with lavender. We used to have it growing in our yard. I’m currently working on a natural fragrance right now! Josie Maran Argan Balm: We have a travel size now. This is used often for your eyebrows to keep them in place, as a hair styling balm, and also for any intensely dry areas like elbows. Josie Maran Argan Oil: This is great for hydrating cuticles and under your eyes. The travel size goes with me everywhere. Josie Maran Argan Brightening Bronzer: I’m obsessed with this. I think bronzer helps you look healthier. A great trick when applying bronzer, is to make the number 3 from your temple down to your chin. So with your bronzer brush, start at your forehead/temple, curve into your cheekbone as if you were writing the number 3 and then curve under your chin. Apply on both sides, so a backwards 3 and a regular 3, on each side of your face. I also like using my bronzer as eyeshadow. Josie Maran Argan High Gloss Lip Quench: It’s like argan oil in a tube. It’s a lip gloss but it’s super, duper shiny and moisturizing. It’s a clear, sheer color. I love wearing this over a matte lipstick and I also put it on before bed as a lip treatment. Josie Maran Magic Marker in Flamenco: You can use this on your cheeks and on your lips. It’s super high pigmented. A great trick when using this is to pop out the Magic Marker back and you’ll get this little bit of color, which you can mix with rosewater or argan oil for your own stain/blush. I love the Flamenco, which is super red and the Quickstep which is a sheer berry. Josie Maran Argan Eyeliner in Black Raven: It’s 100% natural and what I like to do is apply it on the rims [waterline] of my eyes. Then I put it on my top lash line, all the way out – I love to smudge this part. Josie Maran Limited Edition Argan Eyeshadow Quad: This is perfect for a natural smokey eye. Going lightest to darkest with the four colors, I use my finger – usually my middle finger – to apply the lightest color all over the base of my eye and all the way up to my brow bone. It’s a highlighter shade. With the second color I put all over on the base and with the third color, I apply just on the outside corners of my eyes. I make a sideways “V” going from the outer corner of my eyelid. Finally, with the shimmering black color, I put it all over the black eyeliner that I applied over the lash line and I continue down to my lower lash line as well. With the highlighter shade, I put that on the inner corners of my eye. 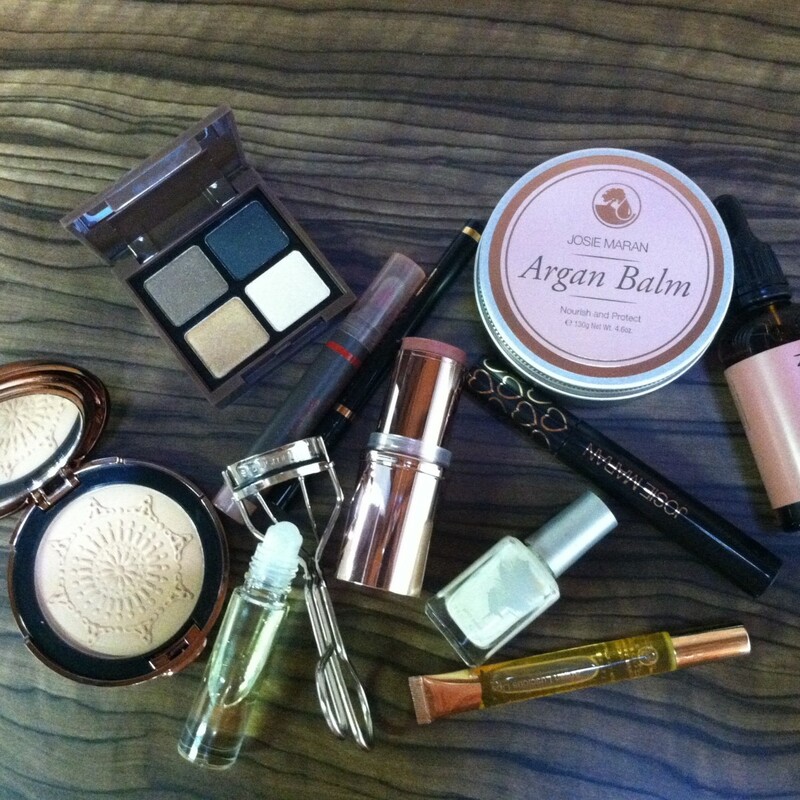 I finish this look off with my Josie Maran GOGO Instant Voluminizing Mascara. That’s my idea of the perfect smokey eye. Josie Maran GOGO Instant Voluminizing Mascara: We have a Get One, Give One program, so for every one we sell, we give one to a woman recovering from cancer. This has a natural carbon black, so it’s super black and naturally good for you. It also has a triple V brush and that gives you triple volume. It separates itself and gives you big, full lashes and because of the argan oil in there, your lashes will still feel soft. Josie Maran Color Stick in Rosy: For my day look, I wear tinted moisturizer, Rosy on my lips and my cheek, and my mascara. It’s a perfect sheer rose color that looks great on everyone. I don’t use a mirror when I apply. Because it’s sheer, I just pop it on my cheeks and blend with my fingers. On my lips, I use it like a chapstick. It’s my blush, my lip moisturizer, and also color for the day. And it’s an Allure Best of Beauty Winner! Dr. Hauschka Lipstick in Sand Dune: I like this lipstick because it’s natural, very hydrating, and provides full coverage. Josie Mara Argan Magic Marker Liquid Eye Liner in Cinnamon: I love a sleek cat-eye when I do a stained red lip – instead of a full-on smokey eye. I use my lightest color, Cinnamon, as my eyeshadow and then I apply my liquid black liner.